So the other evening I was at WalMart. This pack of five guys got in line behind me. Each of them had a case of Budweiser beer, a loaf of bread, and either a package of bologna or a jar of peanut butter. These pictures have absolutely nothing to do with my story about the Beer & Bologna boys. They are simply ones of the Professor taken earlier that evening. I was trying to get him to smile. He kept telling me, "I am smiling!!!!!" Me thinks we have a communication problem. Back to the story. So the Beer & Bologna boys are in line behind me. Obviously some of them have already their fair share of Buds for the evening and they were a bit rowdy and rough about the edges. There was one obvious leader/chief instigator. He was loud. Really, really, really, really loud. He was intent on teaching his posse about how to "hit up a woman" when he wanted to "git with 'em." The ring leader's number one piece of advice? Make sure they have nice teeth. "I ain't gittin' with no one who has black, nasty teeth. I take care of mine and she's gotta take care of her's too. Nasty teeth are one of the best ways to tell if she's worth gittin' with." Whew. Glad he cleared that up for me. Here I was thinking that one of the best indicators of a person's worth was their values and integrity. Silly me. (The Professor never did smile. In fact, that last pained expression was his best effort at smiling for the rest of the evening. It kind of reminds me of the look that was surely on my face as I stood in line listening to the Beer and Bologna boys discuss how to catch a girl). Holy cow, do I ever love this time of year, especially here Virginia. 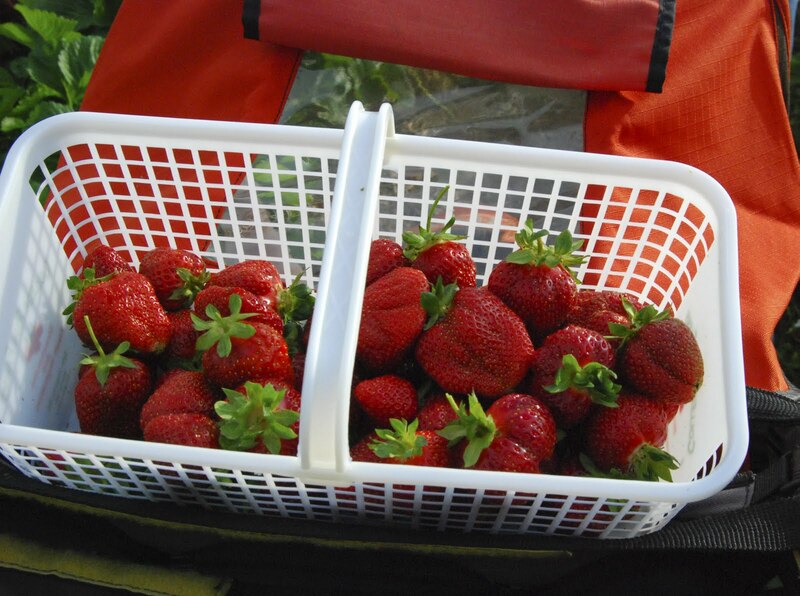 Tonight for Family Home Evening we indulged in a ferry ride across the James River to Surry to pick strawberries. 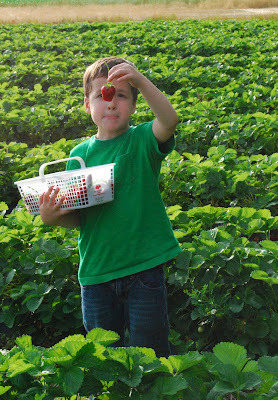 There were very few other people there, making it ideal for my boys to run up and down the rows with nary a care or word from moi. The Princess was not too content to sit in her stroller as we all had a good time, so I carried her on my hip as I picked. I must apologize to Farmer Steve because I think she picked a fair number of leaves as I tried to get to the berries (oops). What these pictures don't capture is the gentle breeze blowing the heady scent of wild rose and honeysuckle across the fields or the warm setting evening sun. It was simply a delicious way to spend the evening. Now I just have to figure out what to do with the four gallons of fresh berries we picked. Here at my amazing sister-in-law's. I love it here, but I am so ready to come home! I miss my king-size bed. I miss my Mac computer. I miss the sound of freedom that kicks off my day every morning (Monday-Friday). I can't believe I am going to admit this out loud, but I miss my minivan, too. Yes, it is true. Pigs have started to fly and that one place has frozen over. It has taken me a year to finally warm up to the idea of driving a minivan, but I really miss the seat heaters, the sun roof, the power doors. I miss the head room and leg space. Don't get me wrong, the moment we don't need the minivan any more, I will get something else, but for now, I have come to peace with the fact I drive a minivan. It also helps that I discovered its color isn't minivan metallic gray but OPI's "Shiny Dancer."